Butler’s men’s track and field team in action during a meet. Both the men’s and women’s teams were at the Meyo Invitational on Feb. 1 and 2. Collegian file photo. The Butler University men’s and women’s track and field teams have set a goal of finishing in the top four at the indoor conference meet. Last season, the men placed fifth out of seven teams while the women were seventh out of eight. 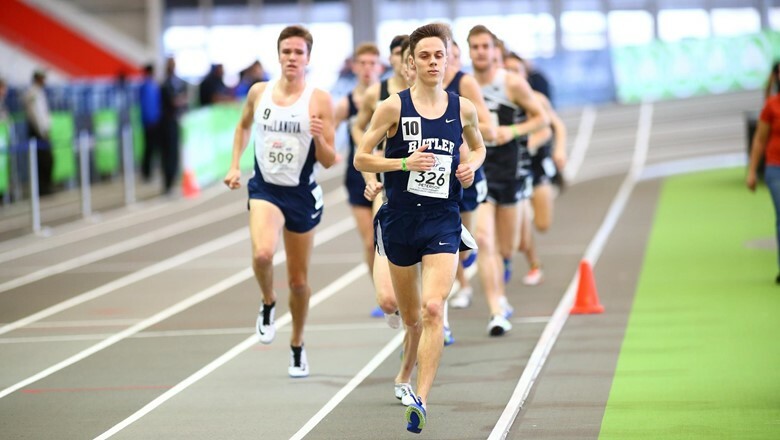 Redshirt senior Johnny Leverenz, who was the 2018 Big East champion in the outdoor 1500-meters, said the team is improving by bonding more. The Bulldogs have competed in seven events already this season, including the Jim Green Invitational, the Illini Open and the Meyo Invitational. Highlights from the Jim Green Invitational include redshirt junior Euan Makepeace finishing first in the 3,000-meters and freshman Mia Beckham finishing her first collegiate mile in 5:07.56. The Illini Open featured senior Allie Vogeler and sophomore Jacob Uhl, who both finished first in their respective 400-meters. The Meyo Invitational produced numerous personal bests for the Bulldogs, including two from sophomore Chandler McGaha in the 600- and 800-meters. Freshman Margo Hornocker also ran a personal best in the 5000-meters. Leverenz believes they can improve this season by paying more attention to things away from the track. In order to improve on their finish from the conference meet, athletes are focused on reaching their full individual potential. Junior Josephine Thestrup, who is a member of the 2016 and 2017 All-Big East cross country teams, said she believes that the team can do well at the Big East conference meets. The Bulldogs have four meets left until the Big East indoor conference championships. A group will travel to Bloomington for Hoosier Hills on Feb. 8, while another group will travel to Seattle for the Husky Classic on Feb. 8 and 9. After that, they will compete in the Friday Night Special in Charleston, Illinois, on Feb. 15. The team will head to the Alex Wilson Invite at Notre Dame on Feb. 16 to wrap up the season before the indoor conference meet. Junior Wade Walder, who was the high point performer, most outstanding field performer and won the decathlon event at last season’s Big East outdoor championships, will have an opportunity to defend his title at this year’s meet on May 10 and 11.